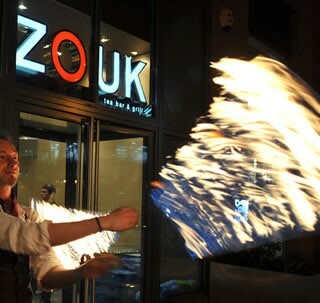 The Bradford Zouk tea Bar & Grill is where the story of Zouk began and was the first restaurant in the Yorkshire region to offer a theatre style kitchen. Located on the busy Leeds Road running into the heart of Bradford the restaurant is renowned for its food and design, and has gone on to win critical acclaim and a host of awards since opening in 2006. The restaurant has a contemporary design with a stylish bar area, private dining facilities and luxurious banquette style seating. The menu offers everything from traditional favourites to seafood specialities, weekly specials, steaks and a full variety of vegetarian and gluten free options. Zouk also has a vast array of sweet treats too prepared freshly each day by our in-house dessert chef. 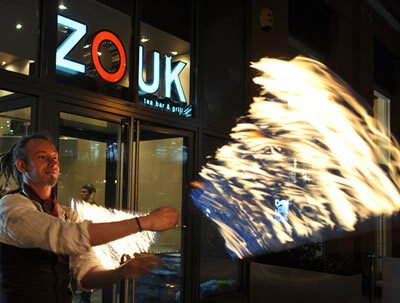 Set menus are available on request for large parties or group bookings. Great food and service, however the tables and menu's were sticky and dirty. Place felt like it needed a good clean. That was the only let down. Staff seem to lack emotion and ability to read situations e.g we wanted to order drinks and had already made it clear we weren't ready to order food so the waitress awkwardly lingered at table after taking drinks order and we had to firmly tell her again we weren't ready! Made us feel uncomfortable. Then when mains came my mum had ordered a korma same as me. I questioned why they were different colours and my mum said it was quite spicy so it was taken away but replaced with the same coloured korma and even hotter than the first one! We couldn't be bothered to complain again but these mix ups should not be happening! We won't be rushing back any time soon, which is a shame as we chose here because the food we have had when they have been at food festivals has been lovely! The food was okay took a while to come and one of the waitresses didn't know what she was doing. Also, a few of my friends got the wrong. A nice welcome and great customer service. The waitress failed to smile once. She wasn’t very friendly. The table we sat at was dirty. The napkins were stained and the salt and pepper shakers were filthy. The starters were very tasty! Asked for a jar of water and didn’t get one. The glasses were also dirty. Overall great food but will not be coming again as the waitress wasn’t very personable and we felt that she didn’t want to be there. Sorry! One of my favourite Indian restaurants. The staff are always friendly and attentive - combine that with excellent freshly cooked food and you’ve got a great combination. Shout out to the waiter who was extremely attentive to a friends needs around her health requirements. Food was amazing as was the service and atmosphere. This visit was my 11th trip to Zouks and the 11th time I’ve ordered the Lamb Nihari. It’s not that the other dishes aren’t good (I’ve tried other people’s) it’s that this is my ultimate dish! Can’t wait to visit again for Lamb Nihari number 12! Very slow service, should have more staff and food wasn’t tasty, just spicy. I had a chicken curry from special board, tasteless. Simply the best place if you'd like a curry! We've been a fw times now and never had a bad experience. Food is always fresh, hot and delicious! Service is good. You'll pay a little bit more in here for a curry than any other place but it certainly worth it! Can't wait to be back again soon! The chapattis are enormous and very fresh. Always delicious, been many times! Always great food and service. Lobster great as always!! Superb food, a little expensive but you get what you pay for!